This forms part of a bronze statue that can be found outside the Minster. 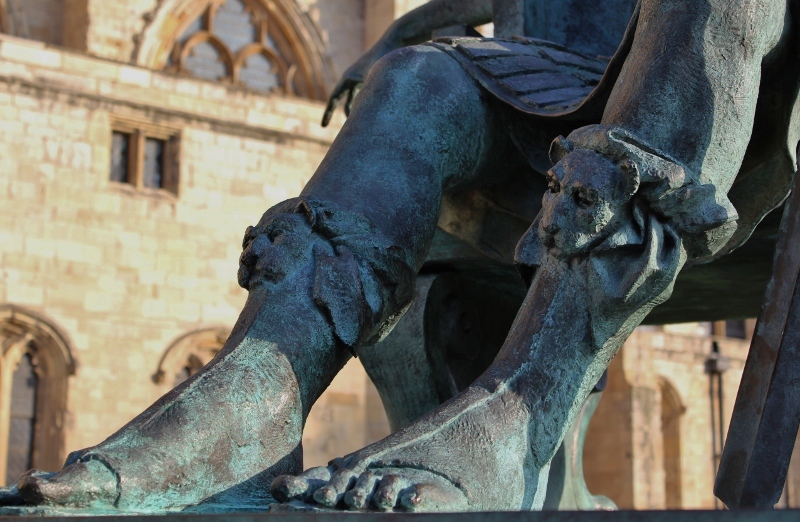 Any idea who these sturdy Roman legs might belong to? If you would like a clue he was proclaimed Roman Emperor in York, and was the first Emperor to become a Christian. I have no idea either - will have to wait until tomorrow! One of the 3 is correct Chrissy, good guessing! Thank you for taking the time to leave a comment on my blog. All comments are read, and I will try to answer any blog related questions. Welcome. The photos on this blog are of my current home town (and birthplace), the City of York. A ginnel is a northern English dialect word for a narrow passage between buildings. York is full of such hidden alleyways. Many ginnels have rather quaint names such as ‘Mad Alice Lane’ and ‘Nether Hornpot Lane’. They can be surprisingly difficult to photograph well. Many street names in York end in the word gate. Gata is the Old Norse word for street and these names may have been in use since Viking times. The name of the street is often a clue as to who used to work in that area of the city. Spurriergate was the street of the lorimers who made horse bits and spurs. Lots of photographic potential here. I have never seen a ghost, nor do I expect to. However, as I live in what is reputed to be one of the most haunted cities in Europe perhaps I walk past ghosts every day without realising it? Maybe some of them will appear in the photos posted here………. Thanks for visiting. All photos copyright dcammish 2011-13. Please email me at deb-cam@hotmail.co.uk if you wish to use a photo. De eerste en laatste van 2015..